With a name like “Grand” and a description on the website that reads “we have created this Hotel masterpiece and can safely assure an experience like no other” you might be expecting something special from Hanoi Grand Hotel. And that’s what you’ll get, though not in the way you might be thinking: it’s just simply good value. A headboard for very tall people. The entrance stands apart from other hotels in the same price range. While it might not be stylish by non-Vietnamese definitions, the open porch, spiral staircase, fish pond and simple sofas in reception differentiate it. 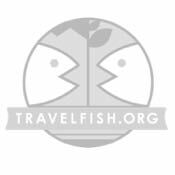 It’s interesting, and a lot of hotels in Hanoi aren’t. Staff was all smiles in a relaxed, rather than uber-professional, way and were happy to show me around. Rooms come in three levels — deluxe city view, junior suite and deluxe family rooms — and even the cheaper, deluxe, rooms are spacious with lots of light. Mattresses have a bit of give to them, rather than being solid, and bedding is of the crisp, white variety. 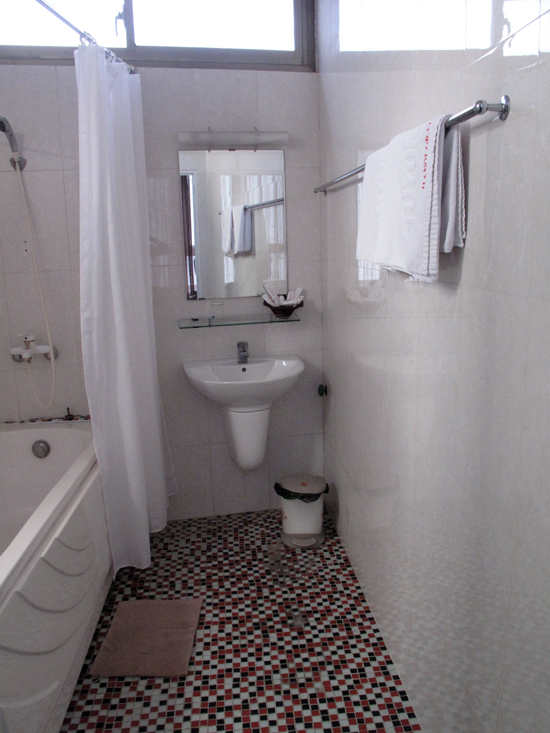 Bathrooms have tubs with shower heads and funky mosaic tiling, which really brightens them up. The room decor is nothing to write home about but very white and fresh, with wooden floors and occasional interesting touches, like the super-large padded headboard cover. All rooms are air-con. As well as flat screen TVs, all rooms come with a computer and WiFi. Breakfast is included — not just bread and an egg but a full choice, including pancakes and a full English. Rates quoted on the website are nonsensical as the promotional rate listed (seemingly permanently) is around half the price, and similar to both the walk-in rates and online deals. We were quoted $26 for a single, $28 for a double, $30 for a junior and $35 for a family room for three people. At these rates, it’s about the best value at this pricepoint that we’ve seen in Hanoi. 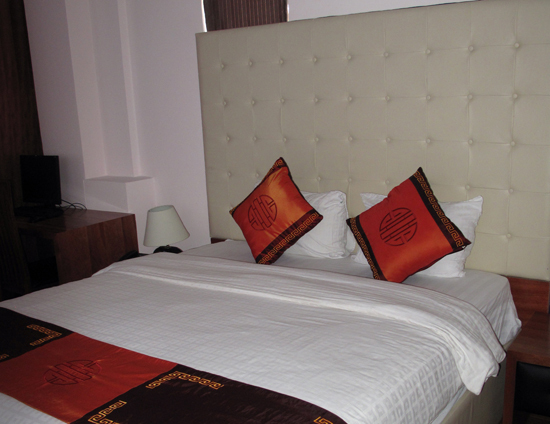 Deluxe rooms are sufficient for a couple, but family rooms and suites come with more beds and more space. Some suites have balconies. 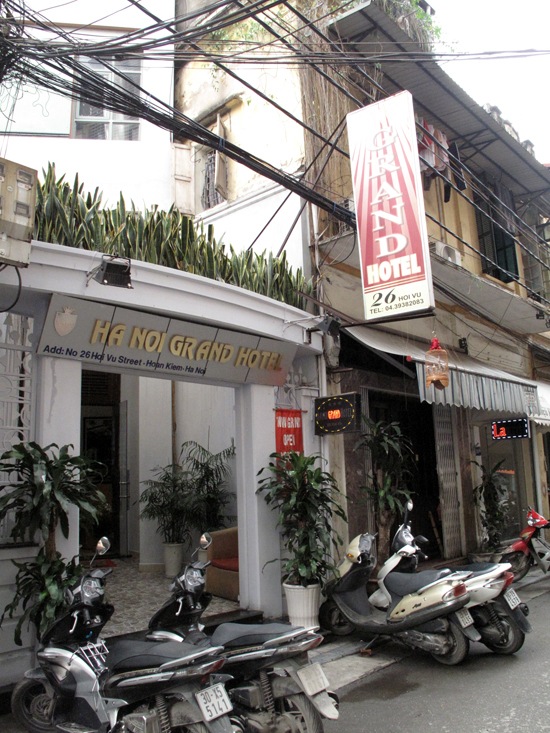 Hanoi Grand Hotel is located on Hoi Vu Street which, while still in Hoan Kiem district, is not in the heart of Old Quarter. Instead it’s located just south of Hang Bong Street, to the west of Hoan Kiem lake. It’s a relatively quiet alley with a few good cafes and eating options and a good spot if you want to stay somewhere a bit more peaceful but still be near to the action. Overall, highly recommended.